Bad weather is no problem for indoor parks. In areas of the United States that experience long, cold fall and winter seasons, indoor water parks are the perfect escape for families to grab a little taste of summertime anytime. 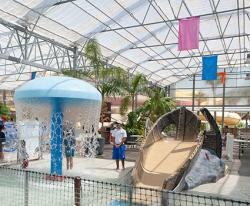 Indoor water parks encompass a range of sizes, from small-scale operations to large productions. With water park attractions located under one roof and offering something for every age, it's no wonder that indoor water parks are, as indicated by Hotel & Leisure Advisors, growing in popularity. Resort chains offer visitors a recognizable brand and options for vacation planning. A chain's different locations offer similar rides and attractions, ensuring that guests know what they are getting when they book their reservations. Families looking for a fun place to stay may want to check and see if their vacation destination is home to one of the ten CoCo Key water park resort locations. 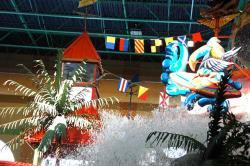 These indoor water wonderlands feature palm trees, constant 84-degree temperatures, and a slew of colorful decorations. With ten locations in the U.S. and one in Canada, this popular chain is synonymous with indoor water parks. The main feature of Great Wolf Lodge water parks is a 12-level tree house fort equipped with water play to make it fun for kids of all ages, along with a wide variety of other activities. A rustic north woods theme is represented indoors and out. From the snow belt to the balmy south, indoor water parks are popular family vacation destinations in many states. Families can spend a day at an indoor water park during their travels, or plan their vacations to include stays at resorts that have on-site indoor water parks. Guests at these resorts can enjoy the ease of having both water park amusements and hotel accommodations in one place. 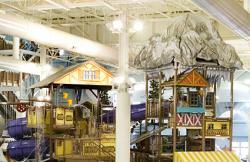 The far-north state possesses one of the longest winters, but only one indoor water park. H20 Oasis is located in Anchorage, the state's most populous city. 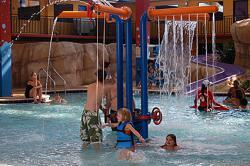 The facility is named as one of the best indoor water parks in the U.S. by the Travel Channel. 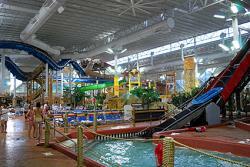 Right next door to Illinois, there are three indoor water parks in Indiana. Two are in Indianapolis and one in Shipshewana. The Old Dominion state has only two indoor water parks, a Great Wolf Lodge located near Williamsburg and Massanutten Resort in Harrisonburg in western Virginia. Plans for a third African themed resort in the Kalahari chain began in 2009, but stalled due to lack of financing in 2012. 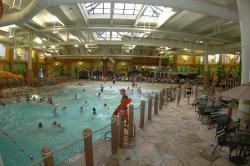 Lazy river - Most indoor water parks include a river that circles the park where visitors can float along in a tube. 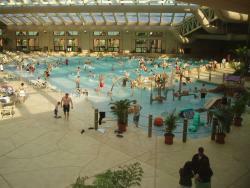 While not the most spine-tingling part of any indoor water park, this relaxing attraction gets its fair share of fans. Tube slides - Tube slides come in different shapes and sizes, with options ranging from tame selections for kids to thrill rides for older adventure-seekers. Body slides - Body slides are backbone of any water park. 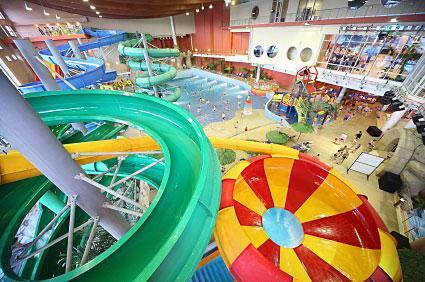 With options that include super fast flumes or winding twists and turns, this is where the action is! Wave pool - This is one of the more popular attractions at any water park, allowing visitors to ride the waves in a simulated ocean. Kiddie area - Indoor parks typically provide an area just for small children, with elements such as dump buckets, sprayers, and child-size slides. Coaster - Depending on the size of the park, some may feature a water roller coaster, propelled by jets of water. Indoor water parks can be an oasis for those plagued by cold winters, though they are not just for cold weather fun. These parks also allow visitors escape the heat of summer and avoid inclement conditions any time of year. 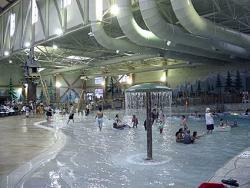 Indoor water parks came on the scene in 1985, with the first built in Edmonton, Alberta, Canada. World Waterpark, as it is known, is over 225,000 square feet and includes the largest indoor wave pool, a variety of water rides, zip lines, and bungee jumping. It wasn't until 1994 that the first U.S. indoor water park was built at the Polynesian Hotel in Wisconsin Dells, Wisconsin. With an increase in the number of these parks over the years, it's becoming easier for families to visit an indoor water park without having to travel too far from home.